The House of Tomorrow is ripe with metaphors, from inventor R. Buckminster Fuller’s geodesic dome house to the omnipresent sounds of punk rock and all the music genre represents. The film depicts a radical coming-of-age for wallflower Sebastian (Asa Butterfield), who has spent his life living in virtual isolation with his idealistic grandmother, Josephine Prendergast (Ellen Burstyn), but finds spiritual kinship in the least likely of people: rebellious Jared (Alex Wolff). Sebastian first meets Jared when the latter boy accompanies his father (Nick Offerman), a Lutheran Youth Group leader, on an outing to one of Fuller’s “Houses of the Future.” Although Josephine lives there with her grandson, the two run the dome home as a museum of sorts and invite tour groups. While Jared and the others are there, Josephine suffers a stroke. Although she is ultimately alright, this forces Sebastian and Jared together at the hospital. Eventually, they bond over punk rock and Jared’s initially selfish motivations for the acquaintanceship (he charges Sebastian $20 for each “lesson”) soften. He opens up about his own poor health (he received a heart transplant six months ago) and encourages Sebastian to join him in forming a band, The Rash. From there, the story progresses in comfortable, familiar stages – agreeable but never especially daring and occasionally resorting to too-convenient plot devices. Although it’s necessary for Sebastian to exhibit a degree of naiveté about the realities of the world, his almost total ignorance stretches credulity at times, overemphasizing the “fish out of water” aspects. He talks and acts like he has been brought up in isolation, yet he takes bike trips to the city and has unfettered Internet access. The House of Tomorrow is interesting in the way it inverts the usual stereotype of having the “innocent” be a member of a conservative, religious household. In this case, Sebastian’s nana is an aging hippie-environmentalist but, like any zealot, she is upset by the thought of “the world” causing a moral infection. Her edicts forbid soda, processed foods, public school, and contemporary music. Once he has tasted these things, Sebastian doesn’t want to go back into a sheltered lifestyle he now perceives as a prison. The House of Tomorrow pays lip service to the life and philosophy of R. Buckminster Fuller, the self-proclaimed “futurist” who died in 1983. In addition to inventing the geodesic dome and coining the term “Spaceship Earth,” Fuller amassed a loyal following of (mainly) young people who embraced his ideas. He believed that society would eventually rely on renewable sources of energy and dedicated his life to the pursuit of this goal. The movie uses a screenplay adapted by director Peter Livolsi based on a novel by Peter Bognanni. On-location filming was done using actual geodesic homes located in North Branch, Minnesota. Although music plays a role in Sebastian’s awakening, this isn’t Sing Street. The punk ethos, more than the songs, is what matters. As Jared states at one point, “Punk isn’t about being hurt. That’s country.” If punk is about fighting the establishment, then Sebastian argues that “Bucky was a punk.” Although the Jared/Sebastian friendship forms the movie’s foundation, in some ways the secondary characters of Meredith (who has a wonderful monologue explaining the nature of her relationship with her brother) and Josephine are more interesting than the leads. I found myself hoping for more of them than the film, with its svelte 85-minute running time, is able to accommodate. Although The House of Tomorrow is content to plunder themes and ideas from other sources, it accomplishes what it sets out to do. It’s an emotionally satisfying experience that brings to life a group of appealing characters and allows them to grow and expand in front of the lens. 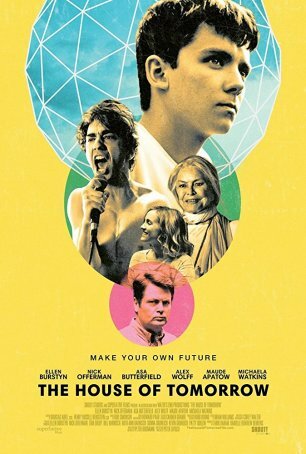 Livolsi’s skillful direction (this is his feature debut) and the committed performances from young stars Asa Butterfield (doing a better job here with an awkward character than in The Space Between Us), Alex Wolff, and Maude Apatow and veterans Ellen Burstyn and Nick Offerman make this a pleasant way to spend 90 minutes.